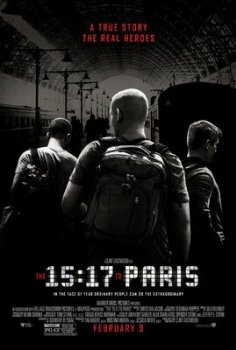 The 15:17 to Paris - Available as a download or stream? The latest feature film directed by Clint Eastwood, tells the brave and unlikely story of three American travellers aboard a train to Paris when a man uses guns and a boxcutter to attack innocent civilians. These three men, alongside three European passengers, were able to subdue the assailant before any lives were lost. “The 15:17 to Paris” is adapted from the book of the same name, which was written by the heroic trio. Spencer Stone, Anthony Sadler, and Alek Skarlatos portray themselves in the film, starring alongside Judy Greer, Jenna Fischer, Tony Hale, and Thomas Lennon. Warermarked, wait for better copy.